Eight months into this "light-duty" position, Joe was ultimately named the Director of this public-based program. In his new position, Joe would co-design a children's state-of-the-art fire safety learning center, which opened in October 2000. This new venue, "The Fire Zone ", in the heart of Manhattan, was nominated and won the coveted "THEA" award at the Emmy's in 2002. Shortly thereafter, in January of 2001, Joe worked on a project with Fisher-Price Toys to help design a new children's "action figure", which was part of their line of "Rescue Heroes". This new action figure was named "Billy Blazes" and was a likeness of a NYC Firefighter, who was an addition to their other "Rescue Heroes ." In conjunction with the Executives of the Fisher-Price Corp., Joe chose the "Fire Zone" as the location for the press conference to introduce "Billy Blazes", and then keeping with a safety theme, ironically chose the date of September 11, 2001, because 9/11 is the Emergency phone number in New York City. Three minutes after donning borrowed bunker gear, at 9:03 a.m., the second jet, flew over Joe's head and slammed in to the South Tower. With a background in Structural Engineering, Joe made an immediate assessment that everyone above the fire was doomed to death, and the buildings would collapse. Sadly, "Billy Blazes" would come to represent the 343 New York City Firefighters who had made the supreme sacrifice of their lives in the rescue effort. Today Joe Torrillo travels the world as a professional speaker with a quest to make our country the "Re-United States of America", resurrecting patriotism, trumpeting the men and women of the Armed Services, mentoring adolescents, and inspiring audiences of all sizes to embrace change and never give up on their dreams. Joe has a wide variety of topics to choose from which are all both inspiring and high in content. His memorable programs are an excellent fit for ANY type of organization. Joe's speaking engagements very often end with a standing ovation, followed by a long line of attendees excited to meet him and shake his hand. 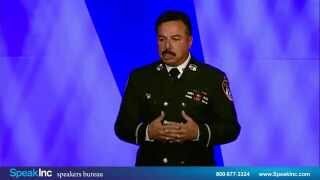 The lessons Joe learned on and after September 11, 2001 inspire attendees to thrive through change under any circumstance, and to accept and handle unexpected stress and adversities - redirecting them with positive empowerment toward reaching their goals and dreams. Attitude and perseverance are everything. **This program will be customized by Joe to meet your goals for the session. In a weak economy, with constant threats of downsizing and layoffs, human behavior will fester in many different ways. Competition has always been the name of the game and will always be what most employees consider their path to job security. Unfortunately, at the end of the day a company suffers from cut throat competition. All Firefighters consider every "save" and every rescue a team effort and rightfully so. Why not take a Firefighter's attitude, carry it to the common workplace, and instill the concept of teamwork for the benefit of all. Joe inspires all levels of employees to keep a "Team State of Mind" in all of their projects and job duties. Attendees leave this session with a renewed sense of their important individual role as a part of the Team! This is a corporate focused presentation focused on bringing all levels of employees and managers together, and re-identifying the intent of a person being dedicated to their work or job. Joe parallels his own career as a 25-year Lieutenant with the N.Y.C. Fire department as both a labor leader and an upper manager. The end result has "the workers" and "the boss" recognizing and appreciating each other's contribution to the efforts of the company. Stereotyping are generalized convictions about people, places and things. Stereotyping is a mental vision that transforms a person's views and ideas based upon prior perceptions. It happens almost instantaneously, all humans are susceptible and it is something that is hard to control. •Is it bad to stereotype? (not always). Beginning with his introduction, Joe sets the stage for his audience with a funny and perplexing appearance. From that point, and until the end of the presentation, the attendees for the first time in their lives begin to fully understand the issues and problems surrounding prejudice, stereotyping and discrimination, and how they develop. The "key point " of the presentation is to remind everyone that stereotyping in general is not the issue, but more importantly it's how we react to stereotyping - which can be a huge problem. Joe will give explicit examples of stereotyping, and will prompt audience participation. This presentation will be sure to teach the skills that may prevent incidents where a person alienates another, ultimately ruining potential relationships or windows of opportunity. The audience will leave the presentation fully comprehending that those who do the most for us in life, are usually those that we least expected. The moral to the story is: Treat everyone equally, because you'll never know who your heroes in life will be. In a world where all too often the ownership of materialistic things becomes a person's priority, people in general have an insatiable need to satisfy their every want and desire. Unfortunately, greed often leads to a life of crime and other misdeeds. Truth be told, after all is said and done - most people end up losing much more than ever stood to gain. Along with their losses, come severe regrets that compromise their happiness, dignity and respect forever. Additionally, their families often pay the cost of their unsavory behavior as well. Joe was a poor kid from an Italian ghetto in Brooklyn, New York who was exposed to a life of crime as a young kid. Instead of following in the footsteps of gangsters, he earned his way in to the most accomplished and respected organizations in the world, the New York City Fire Department. Hear the stories of people of fame and notoriety who threw it all away for the sake of illegal and immoral actions. Using simple arithmetic, people will be amazed how devastating costly greed inflicted mistakes can be. Everyone from the Mafia to missionaries will be discussed, and attendees will think not twice, but a hundred times, before they themselves fall to errant ways. The final message to the audience is simple: It can take a lifetime to build a reputation, but you can lose it one split second.